The new Pulsar 200SS, the first fully faired motorcycle from Bajaj has been photographed in Pune by fellow biker Nikhil Sood. This is not the first time the bike has been spotted and we have photographs of it come in earlier as well. Earlier photographs revealed the presence of an ABS system, hinting at the possibility of it being a Pulsar 375SS. But from what we could dig up it seems like the new Pulsar 200SS will come with ABS as an option. Other details that can we can get from the photographs here is that the bike will sport twin projector headlights. The seating position seems to be quite relaxed and not as aggressive as the R15, in fact the seating looks more comfortable than that of the CBR250R, points there in the daily use column. Even the seat height seems lower, although we will need to wait for the launch to confirm that. The handle bars of-course lies a bit lower than the 200NS. The speedometer seems to be the very same aswell. The good bit though is that the bike looks compact. 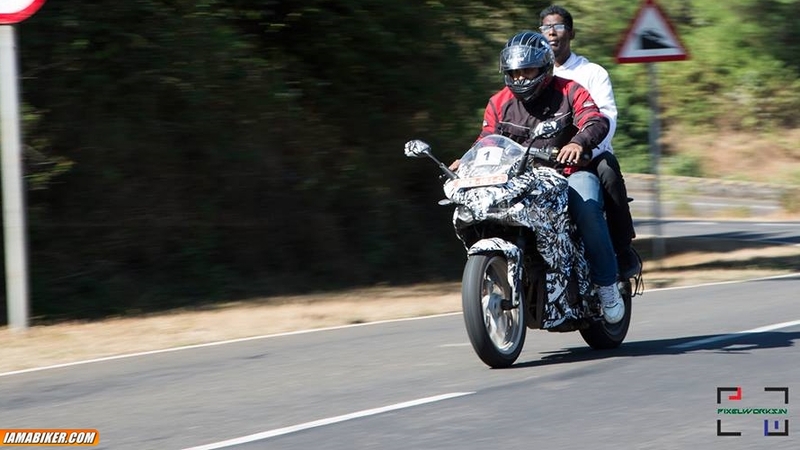 No extra bulk and compare that with the very capable 200 cc engine, which in all probability now will be fuel injected, we definitely are in for a good overall package. Now add to the mixture Bajaj’s strong pricing strategy and we expect the new Pulsar 200SS price to be near the R15’s. Although, all this, if you can forget the fact that the design seems inspired from this. More photographs below.